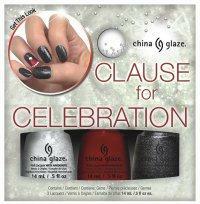 This holiday season China Glaze introduces Twinkle, a collection of shades that perfectly capture the spirit of the season, sparkles in the night sky created by glowing lights, the softness of fresh snowfall and visions of the new year. 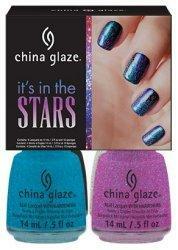 China Glaze Twinkle Collection features eleven new polishes and one effects top coat. 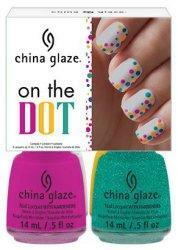 China Glaze celebrates courage and goes pink for Breast Cancer Awareness. Introducing three new matte shades - Life is Beautiful, Sheer Bliss, and Carpe Diem. 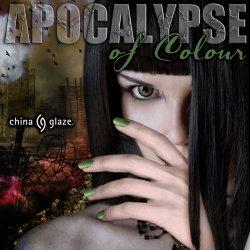 China Glaze brings you immortal manicures with the Apocalypse of Color Collection. But of Corpse you will be frightened with blood splatters and horrifying hues. 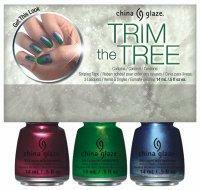 Get your bags packed, we're going full steam ahead with China Glaze's fabulous Fall Collection. An adventurous palette filled with mystery and intrigue. What Are You A-Freight Of? A limited edition color story to coincide with the Weinstein Group's movie adaptation of the award winning novel, The Giver, by Lois Lowery. Summer sizzles with this palette of new neons and hot primary colors. Grab your board and meet me in the water, this girl just wants to have fun in the sun! Shine on with pops of colour and glitters galore. The six-piece, limited edition China Glaze Surprise collection is the life of the party where you can confidently let the pieces fall where they may for the ultimate manicure. 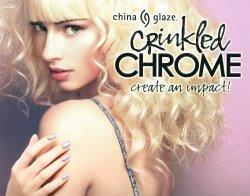 The chunky glitters bring together large matte and shiny particles in feminine, flirty and funky color combinations. Wear alone or as a top coat for an extra effect that's uniquely you. The crosswalk is this Socialista's catwalk...Shedding her winter coat and long layers, Spring is the season to show off her nice stems and blooming personality in poppy prints and patterns. Six chrome colors with a crinkled finish. Chrome meets pastel, giving feminine flair to this crinkled metal look. 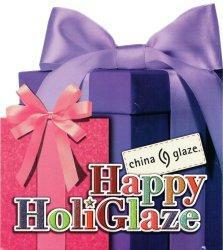 China Glaze invites you to sparkle and shine this holiday season with the HAPPY HOLIGLAZE Collection. Celebrate your holiday's in style with these bright, festive colors and great gifts!